Lily Pond Orchestra returns to the shores of Earth Mantra, this time with a stunning three-disc collection of exhilarating ambient compositions called Suite For New England. Douglas JP Lee, the man behind Lily Pond Orchestra, began working on this epic release in early 2010, though at the time he was only intending to develop three individual pieces. As he composed, however, he realized that these early works were actually aspects of a much larger and more ambitious effort. So he transformed these pieces in progress into this cohesive whole, an album that superbly evokes the mystery, history, and beauty of the land that Douglas loves so much. We chose the word "epic" with care, for we feel this album certainly deserves such a description. We find it difficult to point to -- or perhaps even imagine -- an album of similar length that covers its thematic territory with such aplomb. From the stark vistas of the New England landscape explored in Acadien Mist, to the rich cultural treasures of the Valley of the Poets, to the introspective calm of Lily Pond Reflection, this release delivers one of those rare experiences in the ambient world that both soothes and inspires, that enlightens even as it relaxes. Indeed, the music of Suite For New England somehow expertly fuses the realm of Eno-esque 'ignorable' mood music with a compositional style that is much more active, almost symphonic, in nature. We find this music to be just as suitable as background for reading or sipping tea by the fireplace or napping on a quiet afternoon as it is suitable for active listening with headphones in a darkened room. We particularly love the titles, which stimulate mental imagery as powerful as any we have ever experienced. Masterful. 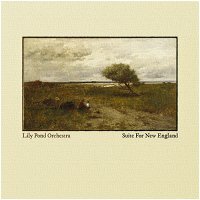 So it is with great pleasure that we unveil the Suite For New England, Lily Pond Orchestra's latest release on Earth Mantra. Highly, highly recommended. Haunting and beautiful, this is one of the finest releases I've heard yet this year.